Over at the Stampotique challenge blog their theme, along with using their own Stampotique stamps, is to use the following colours:- Red, Yellow and Orange. So armed with Dylusions stamps, Dylusions Inks, paper towels and little paint top lids I started working on getting messy!!! And this is the background that I came up with.. a little doodling was added too... Certainly need practise but for a 1st attempt with the inks and paints not that bad....?!?!?! 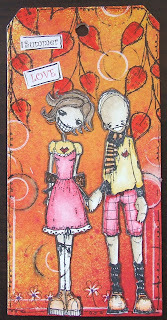 Karin & Eric were stamped onto Neenah paper and coloured in with Polychromos Pencils and blended with Sansador. 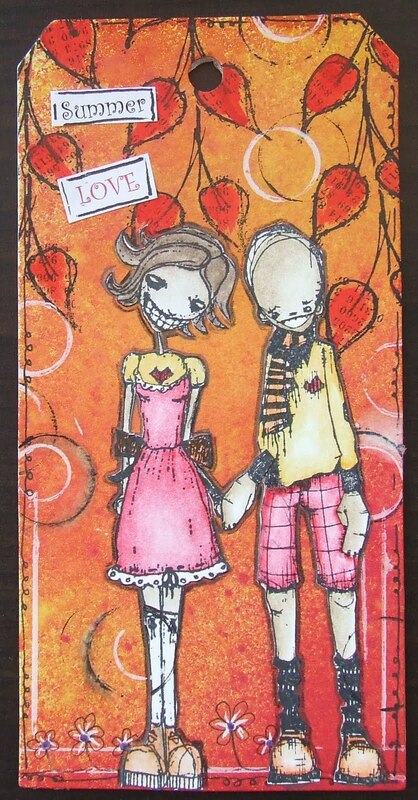 I masked off Erics right hand on the original stamped image and then stamped it again and cut it out as I wanted it to look like he was holding Karins hand (sweet eh)! This is lovely. Thanks for joining us at Stampotique. Love your Karin & Eric tag! Thanks for joining us at Stampotique Designer's Challenge # 35. Beautiful tag. Thanks for joining us at Stampotique Designer's Challenge. They were meant for each other! They both have awesome smiles! :) Fabulous card! I love how they are holding hands, very cute. Thanks for joining us at Stampotique Designer's Challenge.